One of the clearest stories from the NAFTA experience has been the devastation wreaked on the Mexican countryside by dramatic increases in imports of cheap U.S. corn. But while Mexican farmers, especially small-scale farmers, undoubtedly lost from the deal, that doesn’t mean that U.S. farmers have won. Prices for agricultural goods have been on a roller coaster of extreme price volatility caused by unfair agriculture policies, recklessly unregulated speculation on commodity markets, and increasing droughts and other climate chaos. Each time prices took their terrifying ride back down, more small- and medium-scale farmers were forced into bankruptcy while concentration of land ownership, and agricultural production, grew. 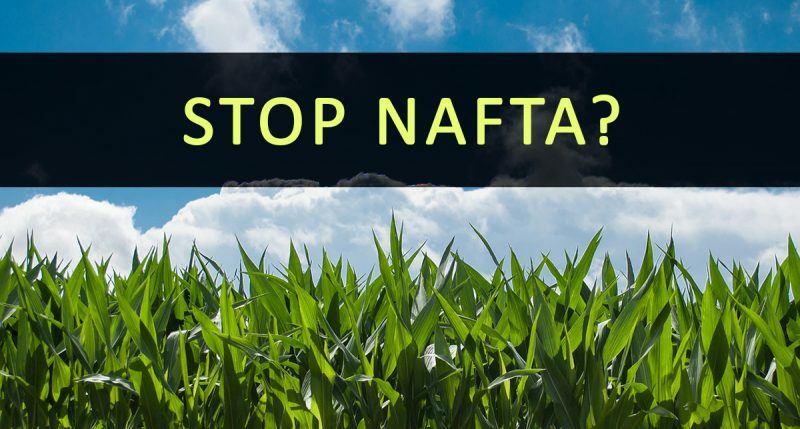 It’s hard to separate the impacts of NAFTA from another big change in U.S. farm policy: the 1996 Farm Bill, which set in place a shift from supply management and regulated markets to an accelerated policy of “get big or get out.” Farmers were encouraged to increase production with the promise of expanded export markets—including to Mexico. But almost immediately, the failure of this policy was evident as commodity prices dropped like a stone, and Congress turned to “emergency” payments, later codified as direct payment farm subsidies, to clean up the mess and keep rural economies afloat. Then, as new demand for biofuels increased the demand for corn, and investors turned from failing mortgage markets to speculate on grains, energy and other commodities, prices soared. It wasn’t only the prices of farm goods that rose, however, but also prices of land, fuel, fertilizers and other petrochemical based agrochemicals. Net farm incomes were much more erratic. In many ways, the family farmers who had been the backbone of rural economies really did either get big or get out, leaving a sector marked by inequality and corporate concentration. Over the last 20 years, there has been a marked shift in the size of U.S. farms, with the number of very small farms and very large farms increasing dramatically. The increase in the number of small farms is due to several factors, including urban people returning to the land (almost all are reliant on off-farm jobs to support themselves) and the growth in specialty crops for local farmers markets. The number of farms in the middle, those that are small but commercially viable on their own, dropped by 40 percent, from half of total farms in 1982 to less than a third in 2007. During this process of farm consolidation, corporations involved in agriculture and food production also consolidated. Mary Hendrickson at the University of Missouri calculates the share of production in different sectors held by just four firms. The share of the top four firms (Cargill, Tyson, JGF and National Beef) in total beef production, for example, increased from 69 percent in 1990 to 82 percent in 2012. The story is the same in poultry, pork, flour milling and other sectors, as fewer firms control bigger and bigger shares of total production, making it even harder for farmers to get fair prices or earn a living from their production. Those corporations take advantage of the rules in NAFTA to operate across borders. U.S. companies grow cattle in Canada and pork in Mexico that they then bring back to the U.S. for slaughter and sale. Along the way, independent U.S. hog and poultry producers have virtually disappeared. Efforts to at least label those meats under Country Of Origin Labeling (COOL) laws have been vigorously opposed by the Mexican and Canadian governments. Meanwhile those factory farms contribute to grow environmental devastation in all three countries. There is widespread recognition among the U.S. public of the need to change food and farm policies to ensure healthier foods and more stable rural economies, but policymakers in Congress and the Obama administration continue to push hard on the same failed policies. More free trade agreements, including the Trans Pacific Partnership (TPP) and the Transatlantic Trade and Investment Partnership (TTIP), largely cut and pasted from NAFTA, but with dangerous new ideas to limit any remaining restrictions on GMOs and questionable food additives, and to pave the way for even more untested emerging technologies. A “new” Farm Bill currently being negotiated shifts from commodity support to an insurance model, which still locks in place the same advantages for even bigger farms and corporations and the same willful ignorance of the devastating impacts of droughts and flooding caused by climate change. The wild ride of prices under the NAFTA roller coaster has left us with a food system that is dominated by fewer and bigger corporations. In many communities across the country, people are opting out of the existing Big Food system to rebuild smaller, healthier options that are rooted in local economies and connections between farmers and consumers. Whether those experiences can build up from the local to national agriculture and change policy is a big question, and one made harder by the huge dominance of corporate interests. But rebuilding the system from the ground up, and considering how to make fairer links to farmers in Mexico and elsewhere, is really the only path forward. [i] Robert A. Hoppe, James M. MacDonald and Penni Korb, Small Farms in the United States, Persistence Under Pressure, USDA Economic Research Service, Economic Information Bulletin Number 63, Feb. 2010, p. 27. A Spanish version of this commentary originally appeared in La Jornada. Original source.